Summer at Standley Park officially began on June 1 with the start of the 2018 Summer Program. Update: Sully & the Blue Eyed Soul Band (originally scheduled for July 22) has cancelled. The Summer Concerts thanks UC local band Relative Minors and Friends (Classic Rock) with UC Resident Greg Zinser for returning to this year’s Summer Concerts. 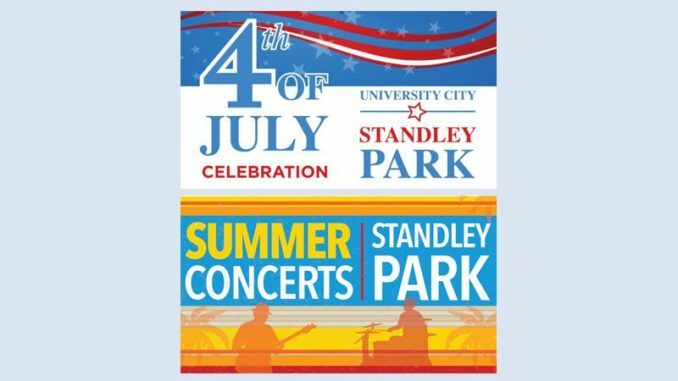 For more information about these special events and to download the 2018 Summer Program, visit the Standley Park and Recreation Center at https://www.sandiego.gov/park-and-recreation/centers/recctr/standley; or contact the Recreation Center at 858-552-1652. Standley Park Recreation Council are volunteers who advise Park and Recreation staff on matters related to programming, events, equipment and improvements. The Recreation Council meets the 4th Thursday of every month at 7 PM at the Recreation Center on Governor Drive. Meetings are open to the public and any adult who is interested in making an impact or has concerns about the neighborhood parks and the recreation center should attend the meetings. Next meeting is Thursday, May 24. The Standley Park and Recreation Center is located at 3585 Governor Drive, San Diego, CA 92122.